Google's launch of a new, self-censored search engine in China is a "black day" for freedom of expression, a leading international media watchdog says. Reporters Without Borders joined others in asking how Google could stand up for US users' freedoms while controlling what Chinese users can search for. Its previous search engine for China's fast-growing market was subject to government blocks. The new site - Google.cn - censors itself to satisfy Beijing. Google argues it would be more damaging to pull out of China altogether and says that in contrast to other search engines, it will inform users when access is restricted on certain search terms. It is believed that sensitive topics are likely to include independence for Taiwan and the 1989 Tiananmen Square massacre, as well as human rights and democracy in China generally. The Chinese government keeps a tight rein on the internet and what users can access through its so-called "Great Firewall". The BBC news site, for example, is inaccessible, while a search on Google.cn for the banned Falun Gong spiritual movement directs users to a string of condemnatory articles. Google rivals such as Yahoo and Microsoft already use censorship in China. The company, whose motto is "Don't do evil", launched its new Chinese service less than a week after resisting efforts by the US Department of Justice to make it disclose data on what people were searching for. "Google's statements about respecting online privacy are the height of hypocrisy in view of its strategy in China," said Reporters Without Borders (RWB) in a press release on Wednesday. The result of censorship, it argued, was that the internet in China was "becoming more and more isolated from the outside world" and freedom of expression was shrinking. According to the Free Tibet Campaign, Google's motto was "in smithereens". "Through its collusion, Google is endorsing censorship and repression," spokeswoman Alison Reynolds said. Human Rights Watch told the BBC that if all the search engines acted together, they would be in a strong position to argue for free access. 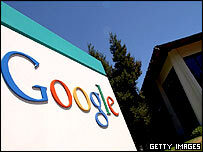 Google hopes its new address will make the search engine easier to use and quicker. Its e-mail, chat room and blogging services will not be available because of concerns the government could demand users' personal information. The number of internet search users in China is predicted to increase from about 100 million currently to 187 million in two years' time. 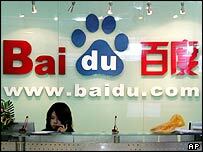 A survey last August revealed Google was losing market share to Beijing-based rival Baidu.com. Should Google censor its search services in China?